With the Fall season upon us and school about to start, It is about time to shift gears in the kitchen. 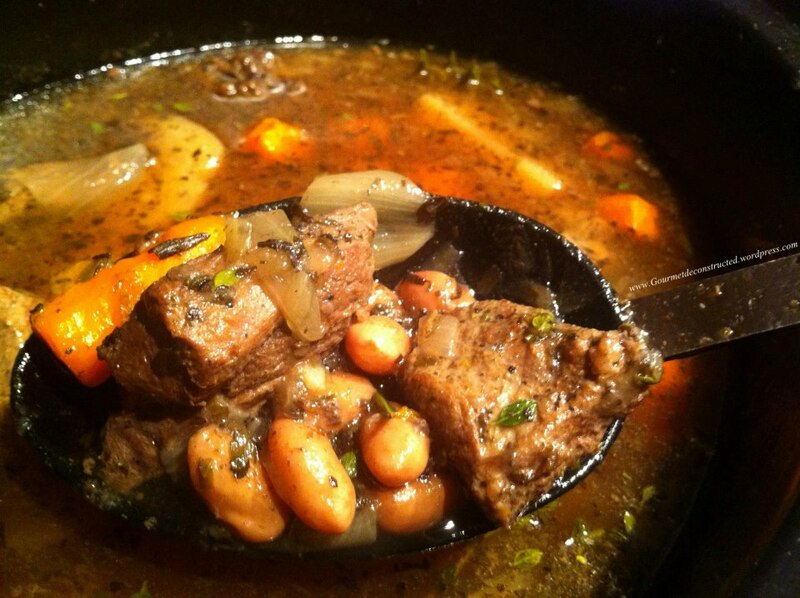 This is the time of year when we begin baking and preparing stews more often. The comforting aromas of roasting poultry, pot roast, stews, pies & cakes fill most households. My kitchen will be no different, that is why I am kicking off this Fall with an easy to make stew prepared in a slow cooker. I was out shopping this past weekend and decided to pick up a slow-cooker to make chili dishes during the upcoming football season. When I returned home with it, I decided “why not use it tomorrow?”. I had Half of a young goose in the freezer that I have been dying to cook for a couple of weeks, so that would be my protein. I also had some fresh cranberry beans still in the pods handy. Now cranberry beans have no relation to cranberry the fruit. Upon doing a little research, I learned that cranberry beans originated in Columbia as cargamanto beans. The variety I am using with the crimson stripes are a relatively new cranberry bean. I found these beans similar to pinto beans but milder in taste. Another thing I noticed was that it did not take long during the cooking process for that beautiful crimson stripe to disappear, oh well. My only experience with cooking goose was a couple of years ago when I roasted one for Christmas dinner. The meat is red and similar to duck, and it also has that thick layer of fat like its cousin. So you really want to trim it good before sticking it in your slow-cooker. I decided to cut the meat from the bone(with a very sharp knife), and cube it like beef stew. 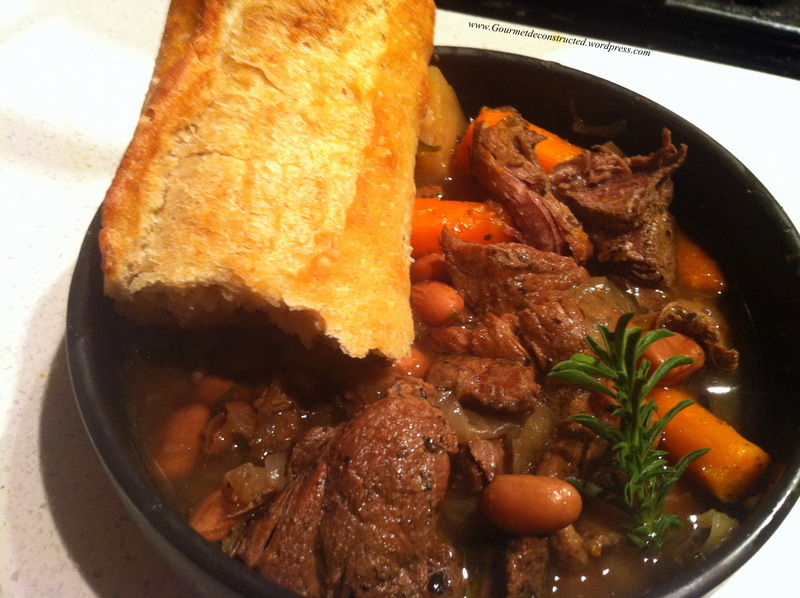 I also decided to use some French spices and garden fresh herbs for this stew. The good thing about this recipe is that you can just throw everything into your slow cooker walk away for 6-8 hours, and come back to a delicious comforting meal. The end result= Goose that melted in my mouth and beans cooked to perfection. Bon Appetit! First, season the goose meat with the Herbes de Provence spices and a little salt and pepper. In a large saucepan melt the butter under medium-high heat and saute the garlic and onions until translucent. Add the goose meat and brown on all sides then remove from heat. Add the potatoes, carrots, and the contents of the goose pan into the slow cooker. Pour the red wine and chicken stock into the slow cooker(be sure to submerge the meat and vegetables) and set the timer for 7 hours and the crock pot to high setting. 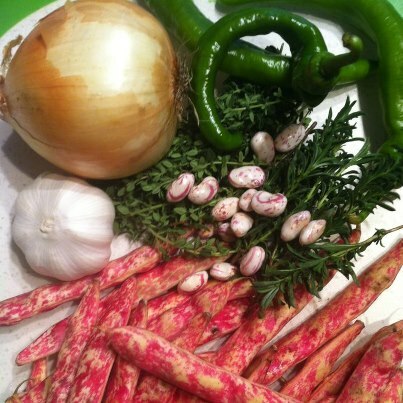 After 3 hours add your cranberry beans.When there are 2 hours left add your fresh herbs. When finished, add to bowl and serve with rice or crusty bread. **When using a slow cooker, I recommend that you not add fresh herbs until there is only 1 1/2 – 2 hours cooking time remaining. This is because fresh herbs can lose flavor if they cook to long. Enjoy!